Ghous Bux Brohi Bansuri Instrument Saaz Singer. He is most popular Sindhi "Bansri Instrument" Master. He was great Artist of Sindh and he sung lot of popular songs on Bansuri. He is popular great Bansuri Player of Sindh and he create great name in Sindh Music and his Flute Music is still most famous in all over Sindh. 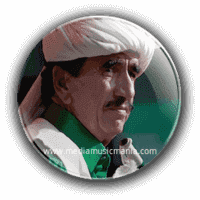 Ghous Bux Brohi started sung songs on Bansri instruments in village culture and feudal society of Sindh, with its rural base, its local "Autaq's" of rural area and most important of all as far as the music is concerned, "Mehfils". He started singing songs on Sindhi Bansri Flute in his childhood. He sung Sindhi Kaafi's, Sindhi Folk Music, Marriage Songs on Bansri. He was popular Bansri player of Radio Pakistan Hyderabad and Pakistan Television. His style singing in Bansri to give spiritual rest to every body. Ghous Bux Brohi has an unforgettable experience in Bansri instrument and one that can never forget his great Bansri Saaz. Ghous Bux Brohi passed a long chapter in Sindh’s cultural history. Bansri Flute Saaz "Instrumental Music" is very popular in all types of Music and called the Saaz of Cutural Mousiqui. He got lot of Awards in this filed specially Sindhi culture in rural area like this instruments too much. I have selected below most popular Music on Flute Bansri of Ghous Bux Brohi.